Are You Ready For an Unforgettable Angling Adventure? Our passion is fishing and we have years of experience for our clients to leverage into premier sport fishing expeditions. 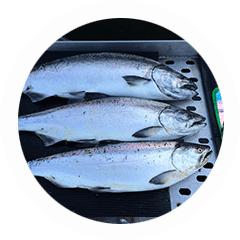 Vancouver salmon fishing is productive all year round. 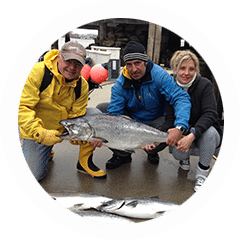 With 5 species of Pacific salmon available in our waters, Pacific Angler always provide excitement! There are several significant river systems that meet the ocean in the area around Vancouver including the Capilano which provides runs of coho and chinook right at our door step, and the famous Fraser River, which is one of the largest BC salmon producing rivers in the world! Georgia Straight, the body of water that effectively splits the Gulf Islands and southern Vancouver Island from Vancouver and the mainland, is not only a productive feeding ground for maturing BC and Vancouver salmon, but also a highway for many other salmon while traveling between their home rivers and respective feeding grounds. Our fleet consists of 23, 25, 27, 28 and 30 foot Grady Whites as well as a 38 foot Uniflite. 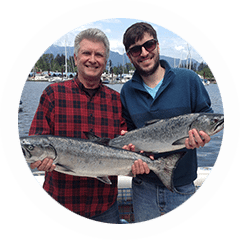 So from 1-2 anglers up to multi boat corporate events, we have the right boats for your Vancouver salmon fishing adventure. With the immediate local waters, which are only a short 10-20 minutes from our dock, Pacific Angler accesses a number of hot spots throughout Georgia Straight and over in the Gulf Islands. This result is fantastic salmon fishing 12 months of the year. "Thanks again for putting together such a great trip yesterday! You did a great job. The guys couldn't stop talking about it all the way home.....and then I received full page emails this morning telling me what I great time they had. We had the ultimate crab feast last night....seriously amazing! We will definitely be doing many more charters with you guys. Cheers!!!"